1. Madewell Jean Jacket - Somewhere in between childhood and being a grown-up (HA! ), I swapped a jean jacket for a blazer or (faux) leather jacket. This coral hue is a great way to update a classic, and perfect for that unpredictable spring weather. 2. J.Crew Fan Fringe Necklace - Spice up any outfit with some colorful bling around your neck in one of my all-time fave color combos. In my opinion, coral and turquoise go together like peanut butter and nutella (my current addiction). 3. Rag & Bone Jefferson Pants - Talk about one pair of chic party pants. The cut says business, the color is all fun. Perfect for the 9 to 5 job, and cocktails afterwards. 4. Tarte Glamazon™ Pure Performance 12-Hour Lipstick - I read a gag-a-licious article a bit ago how women eat an average of 7lbs of lipstick in their lifetime. What the heck!? Gross. While I'm not ready to give up my fave MAC hues, I definitely think swiping on some naturally-formulated lipsticks is a good idea. This Tarte lipstick fits the bill. 5. findersKEEPERS You Sent Me Dress - Living in one of the most casual cities ever calls for a dress that isn't too fussy or fancy. I am smitten with the loose fit, interesting black and white pattern, and killer neon coral color on this frock. Get in my closet. 6. Madewell Simple Mary Jane Wedges - Simply adorable. Great for work and play, and they would look killer with a pair of jean cut-offs. 7. Shoshanna Neon Ruffle Bikini Top & Bottom - Pure hotness. 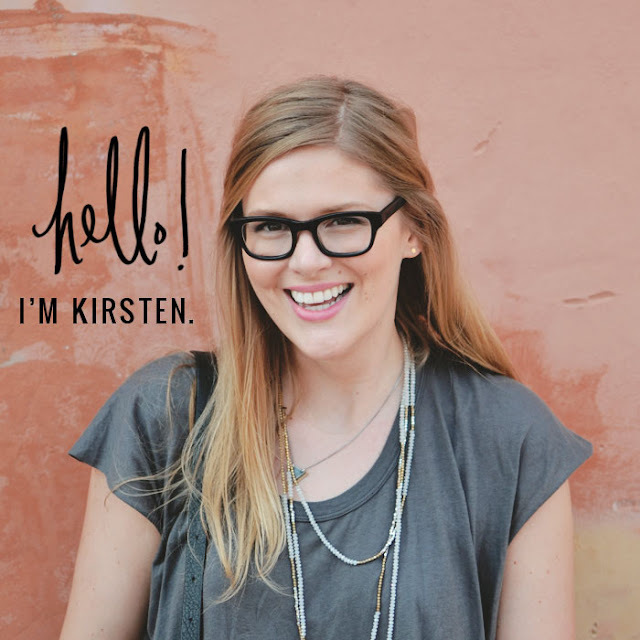 It's trendy, girly, flattering and fun. Now I only need to get my derriere in shape to rock a skimpy suit like this. Time to go do 29483495439 squats. 8. Stila Self-Adjusting Custom Color Blush - I have never mastered the art of blushing your face so you don't look like a sunburnt clown. I love how this Stila blush takes the guesswork out of finding the right hue, and adjusts the color to your skin tone. Brilliant. 9. Dainty Darling Ruffled Blouse - A total steal at $32, this is such a sweet top. I can see it paired perfectly with white skinny jeans, metallic sandals and huge sunnies. Three cheers....fingers crossed they come in a 34" inseam. Actually, I suppose highwater pants are kinda having a moment right now. Win-win. 2,7,9 are my faves..the ruffled items are really cute! HA! I didn't even realize I had two ruffly items on there. Guess I have a thing for that too. That bikini is amazing, totally want it. RIGHT?! The color and ruffles are just so perfect. i dont think ive ever worn coral pants...interesting. I'm so with you -- this is such a great hue for spring. I love those pants! 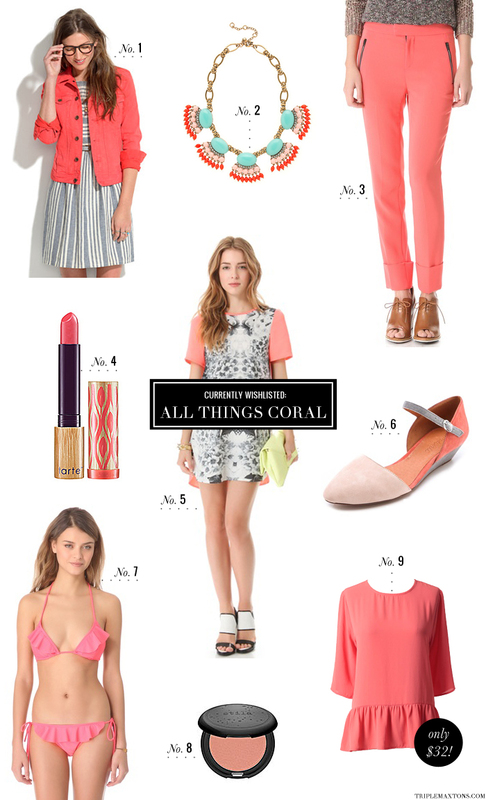 I've been obsessed with coral myself lately! It's been everywhere on the streets of San Francisco! Love that fan fringe necklace too!